A boxed set contained 15mm deck plans for six different merchant starships. 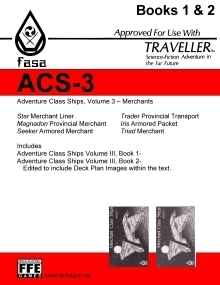 Also includes a book with complete stats for all the vessels, encounter tables, and plans for smaller ships. Boxed with six 17"x22" (double sided) deck plan sheets plus two 16-page booklets. File 1= 5-1/2 x 8-1/2 format booklets. Includes both 16-page booklets (Book 1= ten starship descriptions and inserted deck plans; Book 2= interior details, fittings, and descriptions, images of die-cut counters, and scenarios). File 2= 8-1/2 x 11 format booklet. Includes the deckplans as 8-1/2 x 11 pages. The text of this book has been re-edited to correct obvious errors, and reformatted to include smaller deck plans for reference. The Deck Plans have been edited for clarity. This title was added to our catalog on September 21, 2009.